My scrap bins are beyond overflowing. I need and want to actually do something with them this year so I've jumped on board the Rainbow Scrap Challenge 2014. A couple of months ago the kids and I sorted all of the scraps by color and then promptly stuffed them back onto the bins. 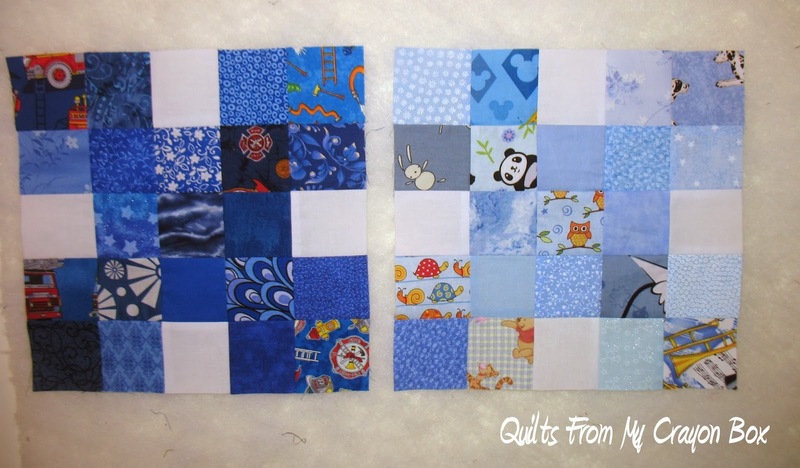 Since January's color is Blue, I pulled all those Blue scraps out and set to work. Here is the darker Blue pile. The picture is really deceiving. It is 16" wide x 10" deep by 8" high.The lighter Blue pile is almost as big. In deciding what block to make, I wanted to be able to use a bunch of different fabrics and to use up as much as possible. A 25 patch came to mind but as usual, I wanted to change it up a tad little bit. By replacing a few of the Blue squares with Bella Bleached White ones, I created a different block that I'm really happy with. This is what they look like. I went ahead and made both a Dark Blue and a Light Blue version. My way my wonky design wall hangs makes them not look square but they are in reality. I really need to make a new design wall soon. I was so excited about how these turned out that I drafted up what the entire quilt will look like once all the blocks are done and I can't wait to see it finished. It is going to be really great. Honest! This project will help me focus on actually using up my scraps and I've spent a bit of time ironing and cutting the rest of the Blue into usable size pieces. 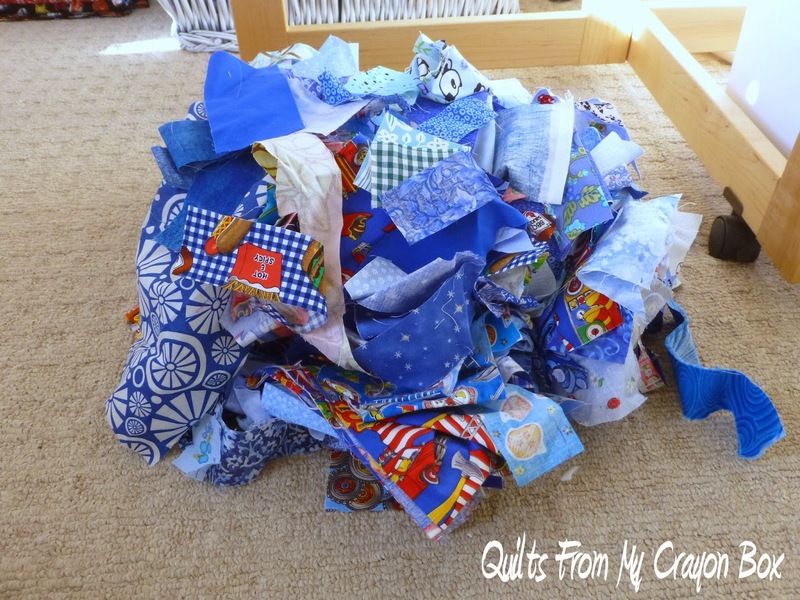 Hopefully all the Blue scraps will be done soon and then I'll use them as leaders and enders to work towards making a few other scrap quilts too. So what will be the color for next month? What great progress you have made. I love the addition of white into your blocks. It will really give you a nice effect when the blocks are put together in the end. So glad you are able to make a dent in your pile! You are on a roll and it is working great. You have given me inspiration. I love the simplicity of your blocks. You've inspired me to join the RSC2014 too! I may be a month behind, but I'll catch up! It feels so good to get those scraps used...I too love the simplicity of your block...imagine a whole rainbow of these...it will be beautiful ! That design is going to make a great quilt. I like your blocks: nice and simple. Very pretty blocks. Looking forward to seeing what you came up with for a final quilt layout. I like the way you added the neutral blocks to break it up a little! Have fun using up your beautiful scraps!